My water heater is leaking what’s next? When a water heater gets to the point of leaking, there is not much left to do but replace it. While you are waiting for us to get there, you can shut off the water to the unit and drain it from the hose bib located at the bottom of the tank to prevent more flooding and property damage. 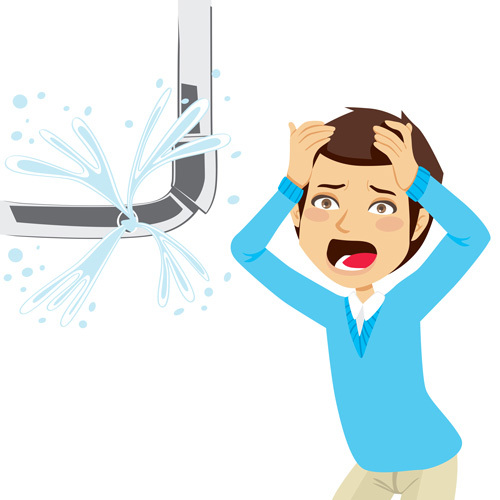 I’m running out of hot water – help! Depending on what type of system you have, the repairs can vary from replacement to minor repair. This will require a phone call and a visit to determine the best course of action. There’s a leak through my ceiling from 2nd floor bath! When you have a leak through the ceiling, this requires a little detective work to determine exactly what is going on. In most cases I can determine what the problem is without opening the ceiling. I have no heat in radiator or baseboard heating! This could be a couple of different issues. Air could be in the lines and needs to be removed, the circulator could have failed and need repair or replacement, or there could be an electronic issue that needs correction. Believe it or not this is one of the most difficult and frustrating jobs for both the service professional and the homeowner. The reason is that many faucet manufacturers do not want you to repair their product, they want you to buy a new faucet. Since they want you to buy new ones, they do not put their names on their products and with designs being so similar across manufacturers, you can not tell what brand or model it is just by looking at it. The only way to avoid this is to save the paperwork you receive with the faucet. This will contain the part numbers we need to locate the parts for the repair. I have a clogged drain – yuck. We receive numerous calls for clogged drains. While this problem is a nuisance, it can be easily remedied by running a snake down through the piping and flushing out the blockage. I do not recommend the use of any chemicals, no matter what the package promises, they are not capable of going through standing water to magically melt away the clog. If you do use chemicals and still find that you need our services, in the interest of safety please let us know what you used and and when you used it. Do not use any chemicals in disposals at all they can react with the aluminum body of the disposal and ruin it. When I go on vacation what should I do? If you are going away during the winter months do not shut off your heat, but do shut off your main water supply so that if there is a problem only so much water will flood into the house. During the summer months shut off the main water only. You can turn off the hot water if you like, but I recommend turning the settings to vacation. Before you do any of these it is important to have your system inspected before taking this course of action to be sure that no problems will arise. Washing machine hoses are the prime reason for home floods when nobody is home. Always turn off the water to your washing machine to avoid this costly and disruptive mess. A burst washing machine hose is like taking the outside faucet sticking the hose in through the window, turning it on, and going for a walk. We have many ways to avoid a flood in your home please contact us and we can help lessen the chances you will ever have a flood in your home.